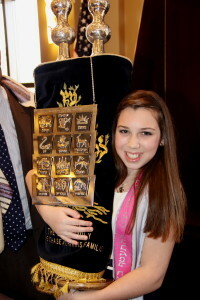 The Bat Mitzvah of Cara Paige Miller was celebrated on March 23, 2013 at Congregation Gesher L’Torah, in Alpharetta, Ga. Cara is the daughter of Elana and Todd Miller. Cara has two brothers, Grant, 10, and Justin, 7, and a sister, Alexis, 4. She is the granddaughter of Alan and Yvonne Hill, and Bobby and Gloria Miller all of Atlanta. Cara is a seventh grader at The Davis Academy. For her mitzvah project, she volunteered at the Cohen home.